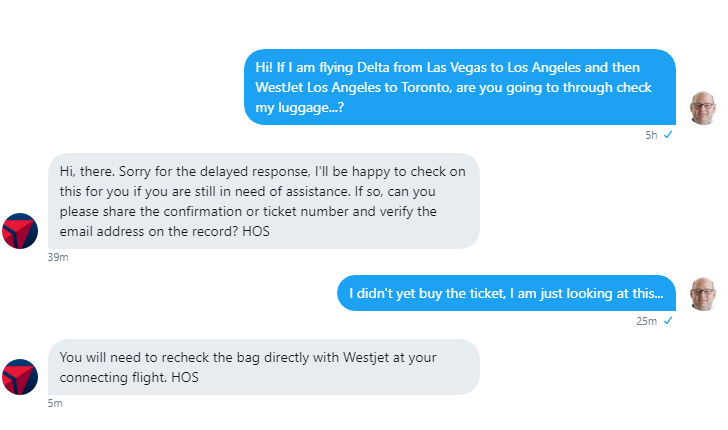 I will be flying Delta from Las Vegas to Los Angeles and then WestJet Los Angeles to Toronto, the airlines are partners so do I have to check my bag again or they will send them directly to Canada. I will be arriving at Terminal 2 LAX and also leaving from the same terminal. You will need to recheck the bag directly with Westjet at your connecting flight. Source: Delta on Twitter. Conversation screenshotted below. Not the answer you're looking for? Browse other questions tagged air-travel transit luggage delta-air-lines westjet or ask your own question. Will I need to pay to have my baggage rechecked at the airport on a multi-destination trip?